I received an invite to drink some whiskey with some friends at the Green Valley Ranch. I was in the company of some serious aficionados. One of the bottles we had was a rye whiskey with a "Prohibition Era Recipe." In addition to drinking it on the rocks, we had some Manhattans (both regular and perfect). 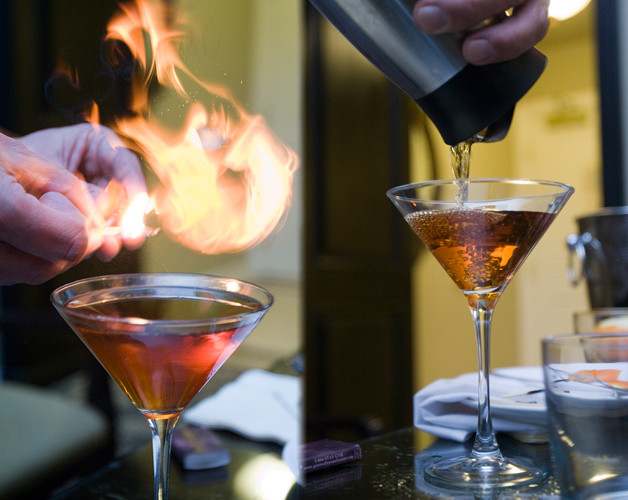 To finish off the cocktail, Greg flamed some orange peels onto the drink. It left a layer of caramelized orange oils on top of the beverage.